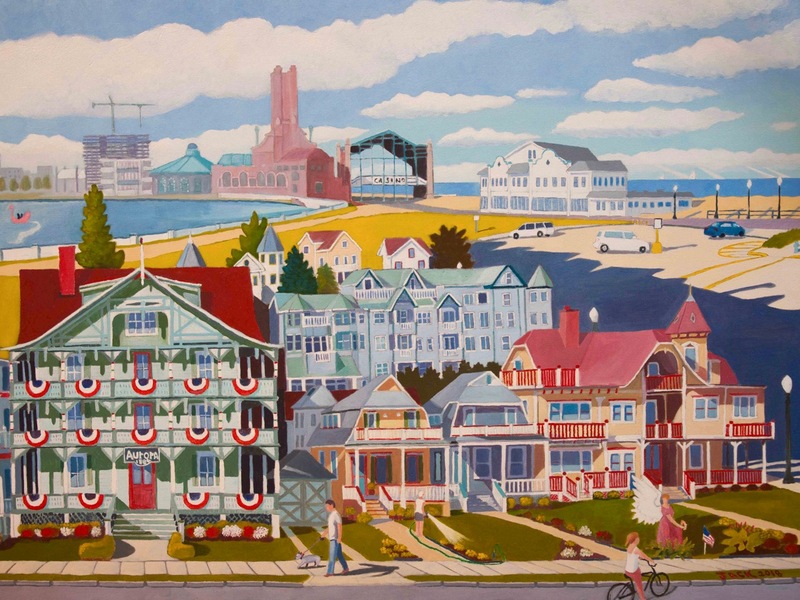 “Heck Avenue” Jack Bredin’s latest tribute to the village of Ocean Grove. 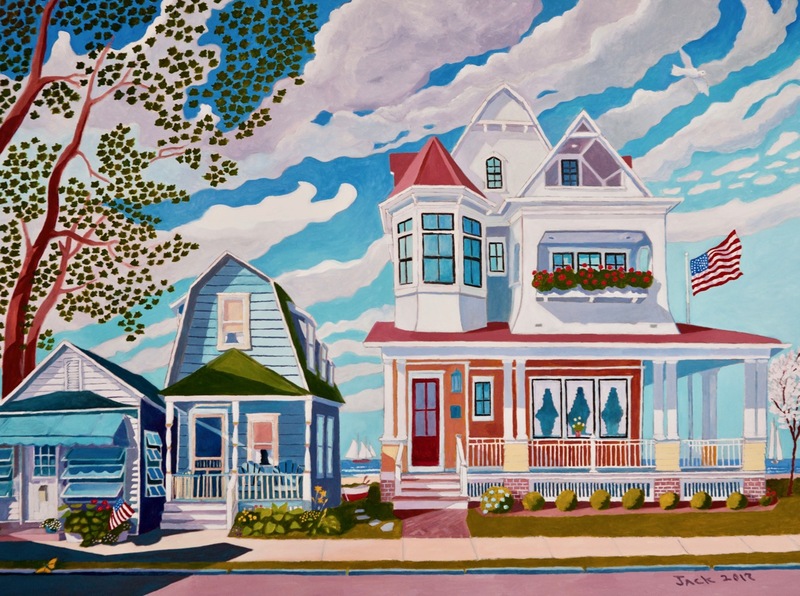 “Heck Avenue” by Jack Bredin of Ocean Grove, NJ. Special to Blogfinger. Jan 1, 2019. Photo by Rob Bredin. 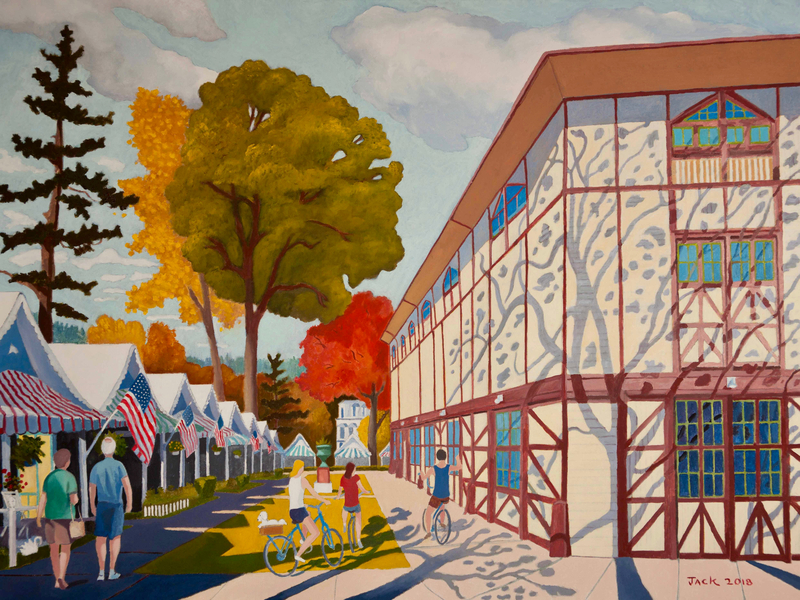 “Tent Village” Ocean Grove, oil on canvas by Jack Bredin. Photograph by Rob Bredin. © Click to enlarge. The tents are arrayed around the Great Auditorium in summer. Those who stay in the tents are part of a unique community within a community. For this oil painting, Jack was inspired by the peacefulness that prevails there, especially late in the afternoon, towards dusk. Here is link to a Blogfinger video clip that captures that sense of place and peace. You can hear the Hope-Jones organ playing quietly in the background. Children enjoy the Village and roam about fearlessly. 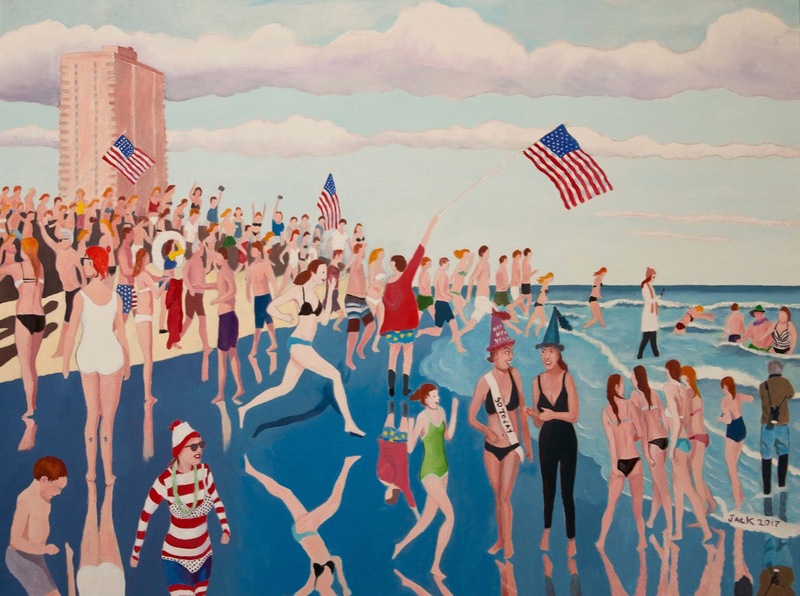 Jack Bredin’s paintings are always on exhibit at the Ocean Park Gallery on Cookman Avenue in Asbury Park. 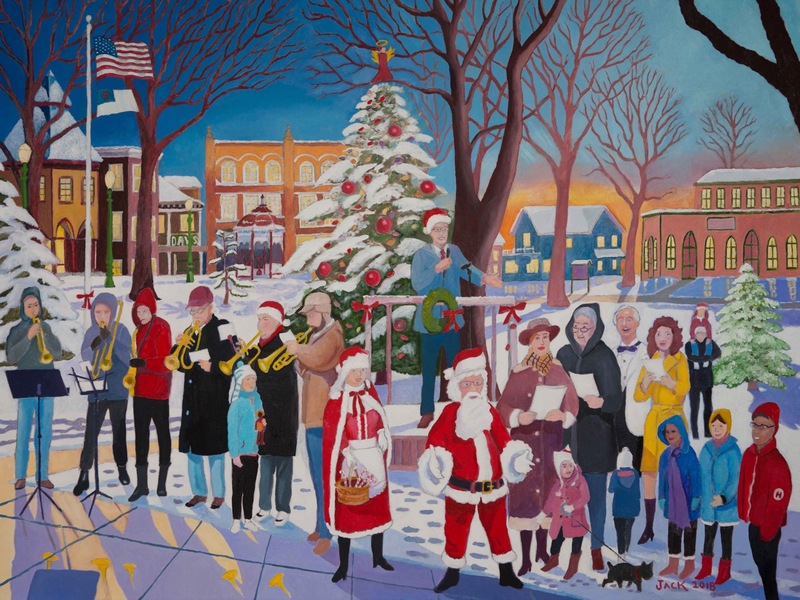 Tree Lighting Ceremony © By Jack Bredin, Ocean Grove. Photograph by Rob Bredin. Click image to enlarge it. You may find some surprises. 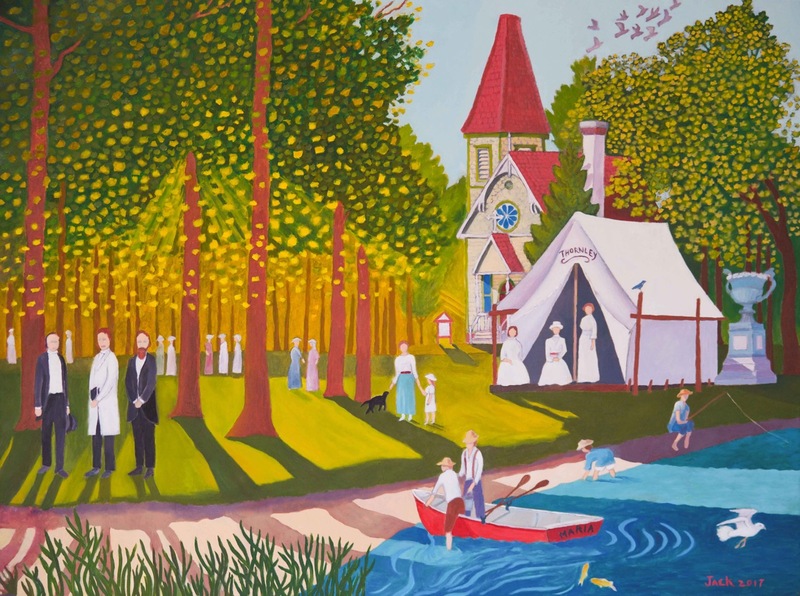 “A Cottage By the Sea” by Jack Bredin. 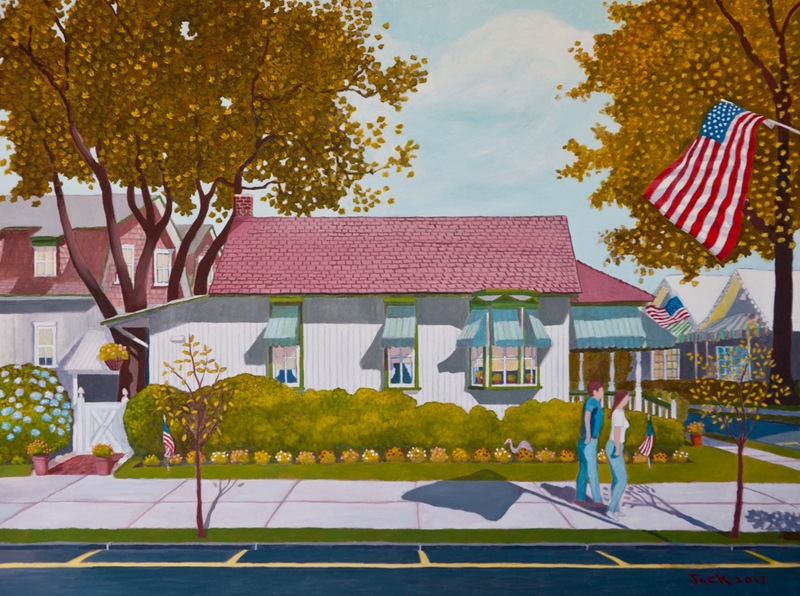 This is an Ocean Grove scene, and Jack continues his series of paintings of our town. Photo by Rob Bredin. July, 2017. 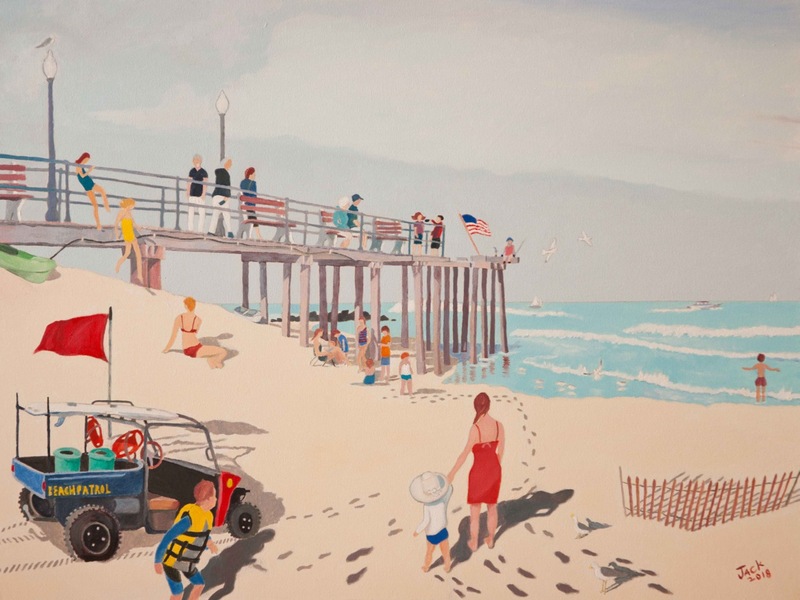 Jack Bredin continues his series of Ocean Grove scenes. 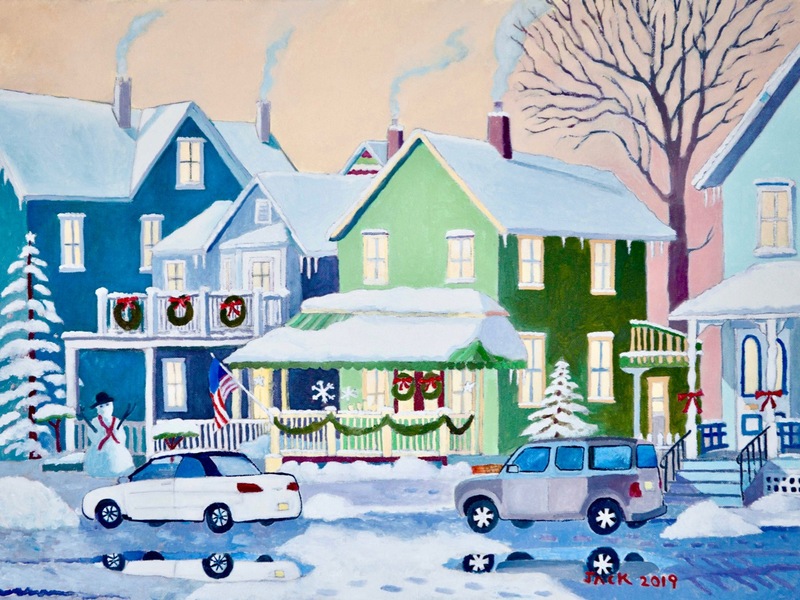 His paintings of our town are famous, and lucky is the art lover who has one hanging in his home. 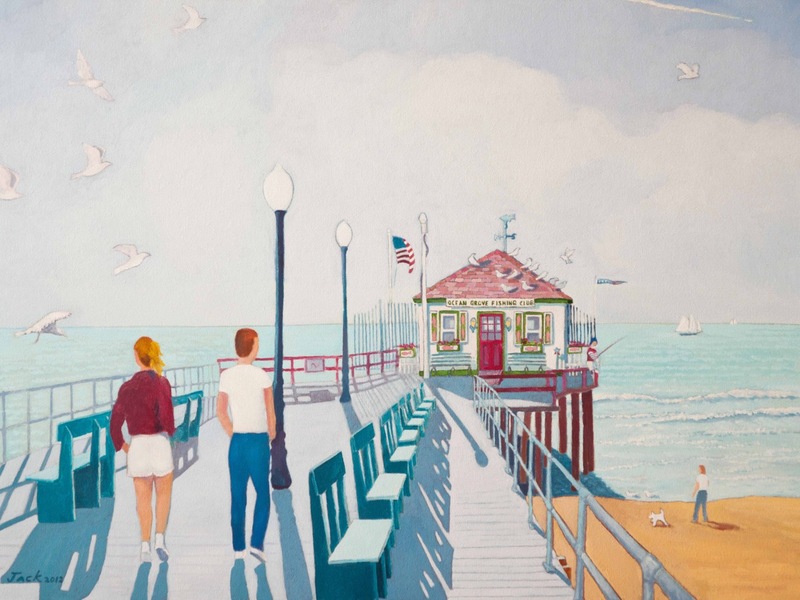 Editor’s note: You can feel the life of the seashore in this painting by Jack. The breezes are blowing the flag and the trees, and you can smell the ocean. The young couple are perhaps planning their evening. Maybe they will go to a dance. Do they still have dances? Well, let’s assume that they do, and he may approach others, but he wants to have the last dance with her; and then he’ll take her to Days for an ice cream soda. PATRICK RIGUELLE AND JOHN TERRA with a song made famous by the Drifters in 1960. Jack has introduced his work before on Blogfinger.net. You can type his name into the search box on top of this page to see more about this fine local painter. Photograph of painting by Robert Bredin. Ocean Grove artist Jack Bredin unveils his latest painting depicting the destruction of the ocean liner, SS Morro Castle. SS Morro Castle on fire in 1934 off the Asbury Park shore. Painting by Jack Bredin, November 2016. © Photograph by Rob Bredin. The SS Morro Castle was an ocean liner in the 1930’s. It ran back and forth between New York City and Havana. On September 8, 1934, during a return trip from Cuba with 571 passengers and crew on board, the ship caught fire about 8 miles off Long Beach Island. Very quickly it became enveloped by the flames. The crew was ill prepared for a shipboard fire, and many people jumped into the water. In the end, about 137 people died of drowning or fire. Some bodies floated ashore at Pt. Pleasant and Manasquan. After the ship was empty, an attempt was made to tow it away, but it drifted loose and went aground near Convention Hall in Asbury Park. It stayed there for about 6 months where it was a tourist attraction. Then it was towed away and scrapped. 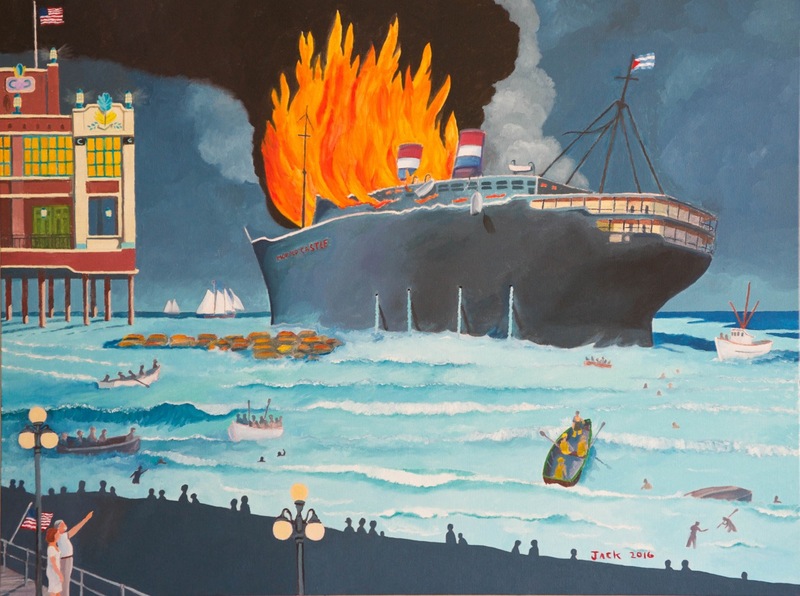 Jack Bredin’s folk-painting style is to add a bit of poetic license to his works, so the facts may not be exactly correct—thus the ship burning off Asbury Park.